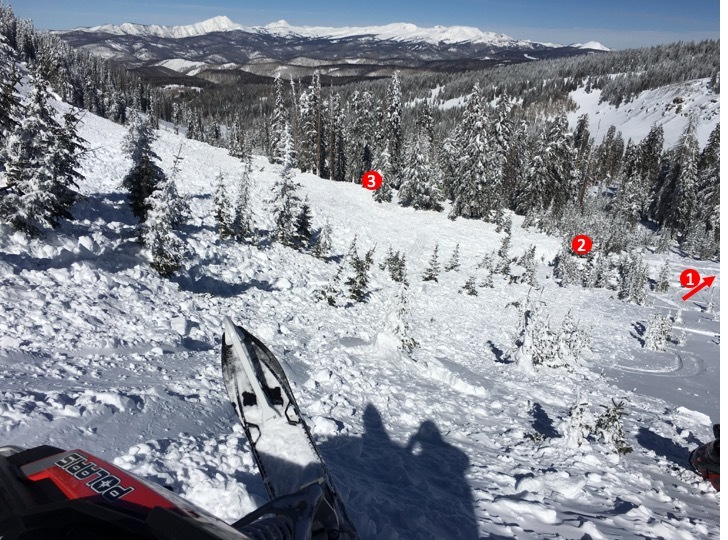 Three people from Washington, UT were snowmobiling near Circleville Mountain. At the end of the day they parked under a bowl just north of the peak when they triggered an avalanche on the east facing part of the bowl. It was their first day of riding on this trip in this area. One member of the group has a cabin nearby. They had ridden in the area at least two times previously this winter. Once before Christmas and another time in mid January. Their plan was to finish riding in the area near the accident site then return to the cabin to meet another person. They had not seen any avalanches. They had no formal avalanche training. 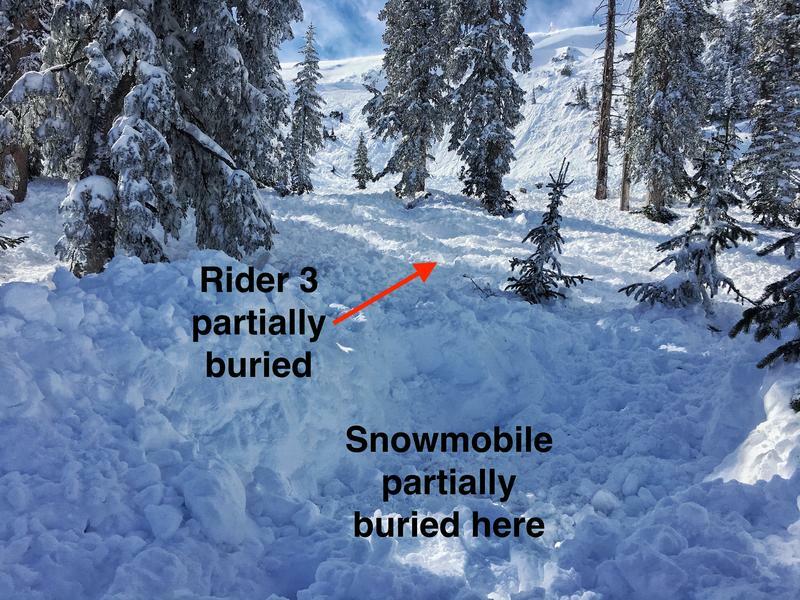 Brad (rider 2) attempted to ride southeast but was caught and fully buried (1-2 feet deep). He was 10-15 feet downhill of his snowmobile which was fully buried. Todd (rider 3) was caught and partially buried. Only his fingers were sticking out of the snow. However, it was just enough for him to begin slowly dig himself out of the debris. He was 40 feet uphill of his snowmobile which was partially buried. None had avalanche rescue gear. Riders 1 and 3 searched for about 30 minutes but could not find rider 2. They called 911 at 5 p.m. Some SAR members approached the area that night but could not safely enter the area due to darkness and avalanche hazard. On Friday, Feb 8th, SAR personnel resumed the search and rescue operations. Scene safety was assessed from the air via the DPS helicopter. Then the helicopter crew performed a RECCO search in hopes that the RECCO detector might get a signal return from some metallic object or electronic device on either the victim or his snowmobile. They detected some signal and marked that location. Next, they flew 2 blasters to the top of Circleville Mountain with explosives. These two people triggered a hard slab of wind drifted snow and deployed explosives in a few other areas. Meanwhile ground crews were waiting in a staging area. Once the scene was safe, the two blasters with one person from the ground crew located the victim's fully buried snowmobile using the approximate location from DPS, a hand held RECCO device and probe poles. Rider 1 had provided a last seen point for Rider 2. The last seen point and the location of the snowmobile narrowed the search area considerably. WBR had 4 dog teams ready to search. The first dog team was delivered to the top of Circleville Mtn at 11:02 a.m. The dog and his handler descended to the avalanche debris and located the victim at 11:11 a.m.
A landing zone was established about 40 feet from the victim's location. The victim was transported via helicopter. SAR personnel unburied the two snomobiles. Both were driven out of the area. This accident occurred in Beaver County on the Fishlake National Forest. Below is an account of the accident from Rider 3. We sincerely appreciate his willingness to share this information so that we all may learn and become safer riders. I figured there would be plenty people that would like to hear the story, so I'm writing it down before it gets covered with emotions and other stress. I don’t know that I’ll ever forget it, but maybe small details. Around 5 pm on Feb 7,2019, Brad, Shad, and I went up to prep Brad's cabin (up Beaver Canyon) for a little couples weekend trip/birthday time. One of Brads favorite things to do was snowmobile, and it was always a good time going with him. We went early to spend the day riding before our wives came up that next morning. 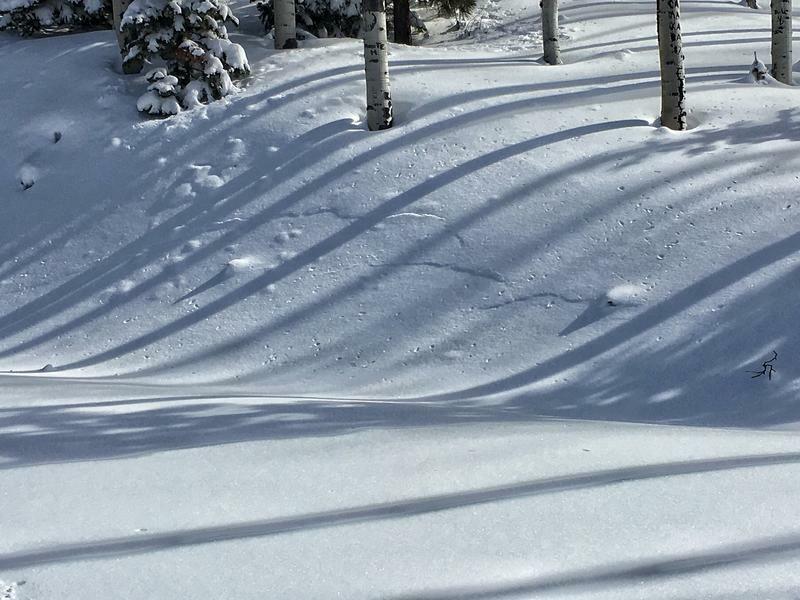 There was a recent storm that dropped 34”+ or so, which made the snow super fun and very deep. We had decided at the end of our ride to run up a canyon to just look at this big bowl/basin at the bottom of Circleville Mountain. Quite a ride in the thick snow off the main trail. None of us planned to try and go up the big chute, but I've watched Brad and Shad try a couple times in previous years. Shad led the group up the canyon and veared off thru the trees towards the east opening. Brad went straight and I followed him. I couldn’t see where Shad had stopped, but I stopped about 50 yards into the trees shy of Brad (which was right at the base of the hill in the open). Only stopping for a moment, I looked up and saw an avalanche coming quickly towards us. I yelled to Brad and finally got his attention. He looked back and quickly tried to ride away from the avalanche. There was nothing I could do..
Then, I could feel it... My right arm was raised still and I could feel the cold outside air with my fingers. (The force of the avalanche has also ripped off my right glove). For the next 5 minutes I wiggled my fingers to make a hole, then I could wiggle my hand, then I could start digging to my wrist, then I could slowly move my arm. Finally fresh air and more light came, and though I was still stuck, I could see light and breath - that was all that mattered. My left side of my body was in bad shape. I couldn’t dig, and it was hard to move due to the pain. With one arm, I worked the next 10 minutes or so at unburying myself from head to waist, then all I could do was scream......It was quiet... No answers.... I yelled again, then I could hear Shad's voice off in the distance. But not Brad's... I pulled my phone out and saw I had 1 bar of service with 5% battery, so I dialed 911. They were able to ping my location and said they’d get help on the way. The sun was starting to set. Minutes later Shad ended up finding me and crawled to help me move to a position to lay down to help with the pain. Frantically we yelled for Brad. Shad searched, but couldn’t go far from me due to the conditions. We were stuck, and completely hopeless. In pain, cold, and unable to help our friend... Over the next couple hrs we waited up there. Shad made a few more phone calls to Nicole and Brad's Dad. We also talked again with 911 and Search and Rescue told us to get out of there. 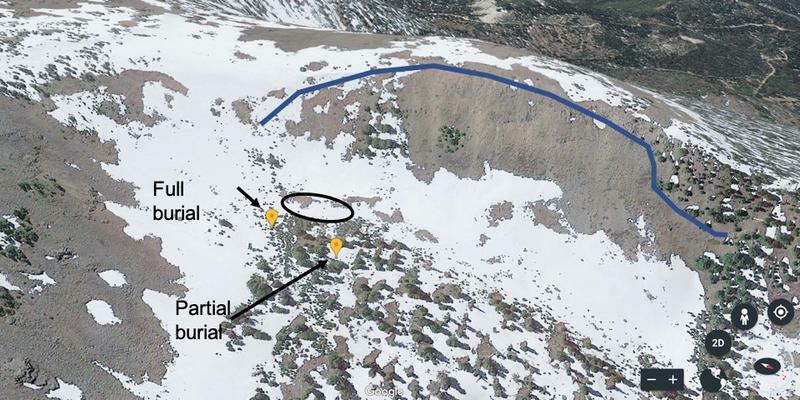 The first photo below shows the avalanche triggered by explosives in the red circle. Terrain to the left of the photo was blasted but did not produce additional avalanches. The second photo below shows the approximate locations where riders 2 & 3 were buried. Rider 1 was positioned outside the frame of the photo in the direction of the red arrow. This avalanche occurred on an east facing slope on Circleville Moutain. The top of Circleville Mountain is flat. This is significant because it provides a large area (or fetch) for winds to grab snow and redeposit it on the slope that avalanched. The avalanche was approximately 1000 feet wide. It broke 3-10 feet deep. The non wind-loaded portion of the crown was 3 feet. Most other areas of the crown face were heavily wind loaded and much larger. The alpha angle was 23 degrees. This area is outside regular forecast zones, and we have limited snow and avalanche information. 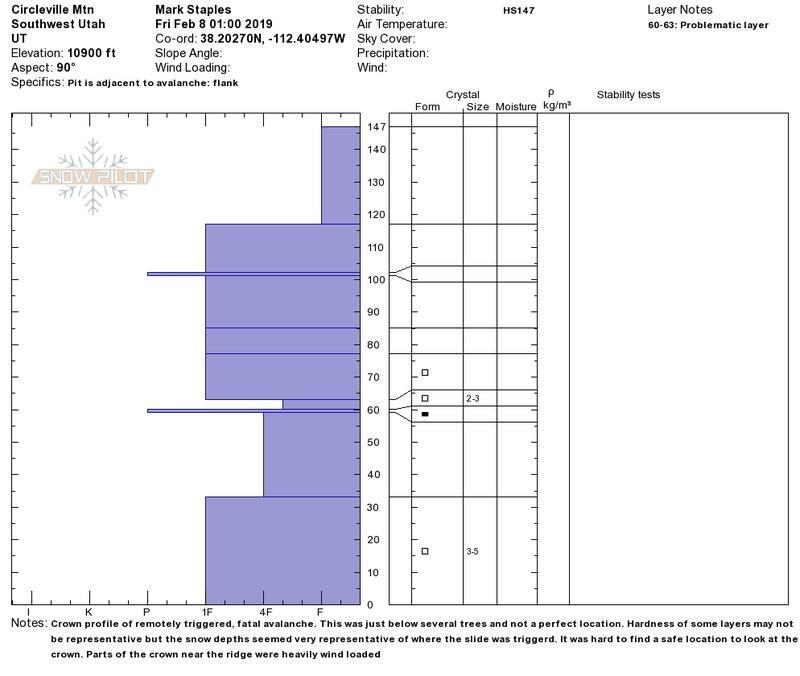 The Utah Avalanche Center publishes observations from the public for this area. 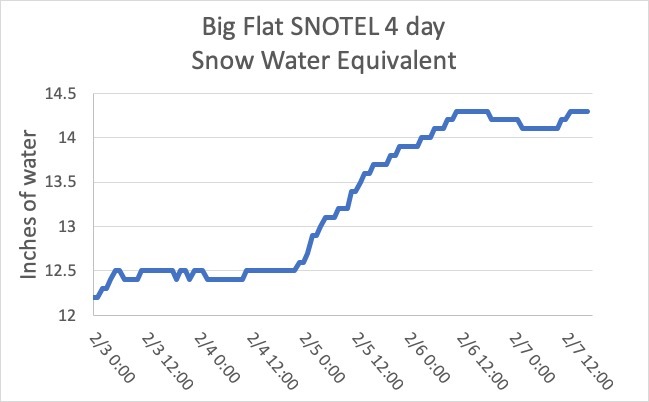 Precipitation and wind data were collected from the Big Flat SNOTEL and Beaver 15E. Both are about 7 miles NNE of the accident site at at elevations of 10,349 feet and 10,007 feet respectively. 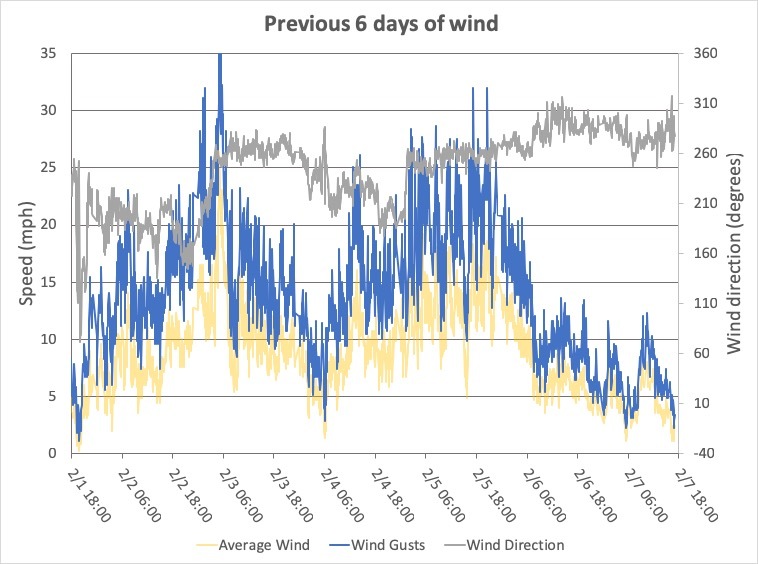 Graphs of wind and precip data are included below. 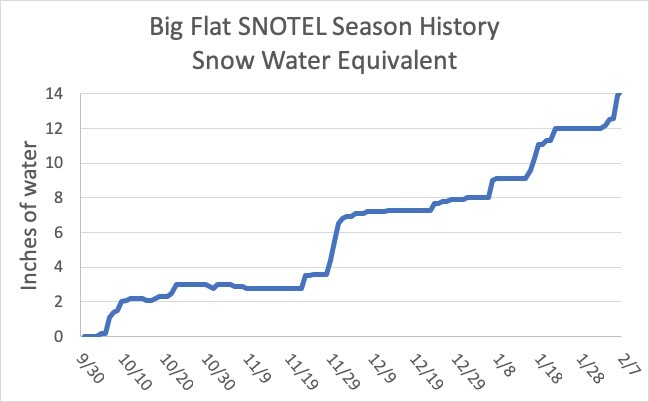 While riding into the scene on snowmobiles, we noticed widespread cracking and collapsing of the snowpack, a sign of unstable snow, along the road on small slopes both above and below the road. The photo below shows an example of one. The cracks appeared to be at least a day old. The first photo below shows the north end of the avalanche. The two riders were caught on the opposite end seen in the distance about 900 feet away. Below are photos of the full burial site of the victim, his buried snowmobile, the location of the partially buried person and his sled. This search and recovery was performed by Beaver County SAR, Piute County SAR, Sevier County SAR, Wasatch County SAR, Utah Department of Public Safety (DPS), Wasatch Backcountry Rescue (WBR) with professional ski patrollers from Park City, Brighton and Snowbird, Forest Service Law Enforcement Officers, Forest Service Utah Avalanche Center (UAC), and Utah Division of Natural Resources.